2.Dark gray baseball hat. 6 panel unstructured, adjustable back Sold Out!!!!!!! 3. 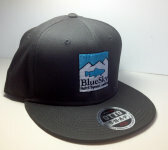 Dark gray flat bill hat. structured,adjustable back.